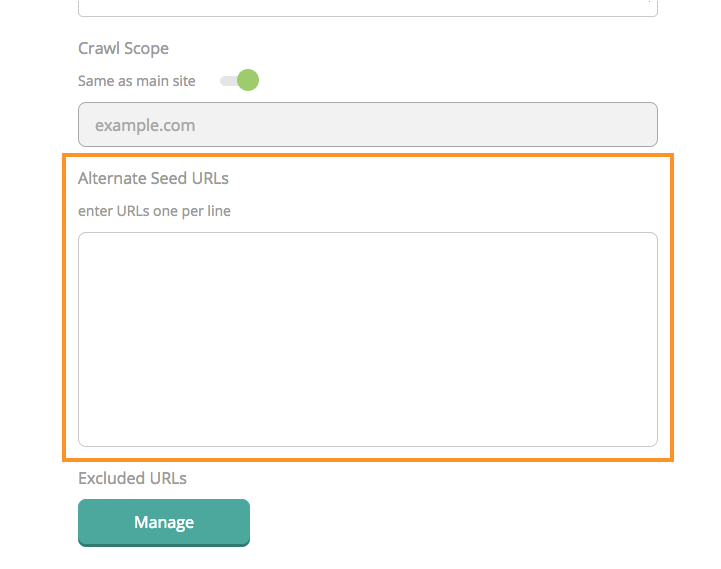 Alternate Seed URL is another URL (in addition to the Website URL) we will start crawls from. This is a real scenario from a user. The user would like to track rankings for all subdomains for harrywinston.de. To do this, the user sets the website URL to http://harrywinston.de. However, http://harrywinston.de returns a 404 error. It does not redirect to http://www.harrywinston.de, like we may expect. So when Dragonbot goes to visit this first URL to crawl the site, we stop immediately after the first 404 page. However, the user still wants the site crawled. In this case, they'd enter website URL as http://www.harrywinston.de so we can get ranking for all subdomains, then set the Alternate Seed URL to http://www.harrywinston.de so we can crawl the site without issue. The website URL is http://www.example.com. It is a very large site. Dragonbot will normally reach the crawl limit before reaching the "products" subdirectory, since it is less directly linked to from the home page. Therefore, this subdirectory never gets crawled. However, the user wants this directory crawled as well. The user could set the Alternate Seed URL to "http://www.example.com/products", so now we will start our crawls from both the home page and the products subdirectory, so we can crawl a bit of this subdirectory before we run out of credits. It's true that the user may be able to accomplish this by using exclusions, but it could be more complicated. This provides another approach. The website URL is http://example.com, which redirects to http://www.example.com. There is a subdomain of http://support.example.com that the user would like crawled. However, no pages on the www subdomain link to any pages on the support subdomain. Therefore, Dragonbot will never follow links to go to the support subdomain. By adding an alternate seed URL of http://support.example.com, we can be sure it is crawled as well. 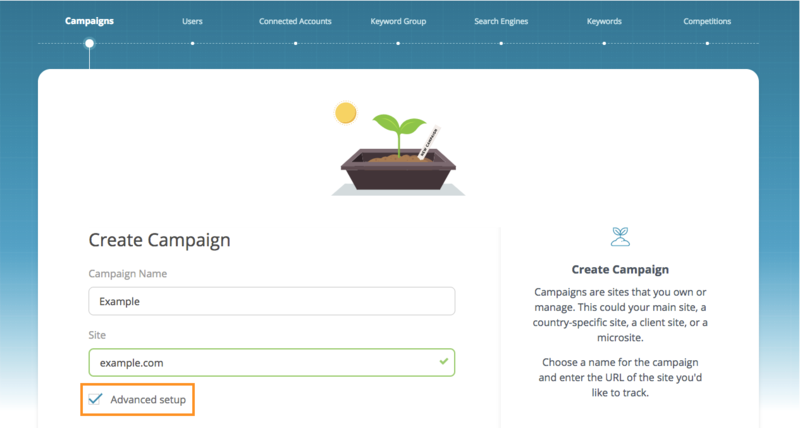 There are 2 ways to setup alternate seed URLs, from the Campaign Settings screen or Quick Start Wizard when creating new campaigns. 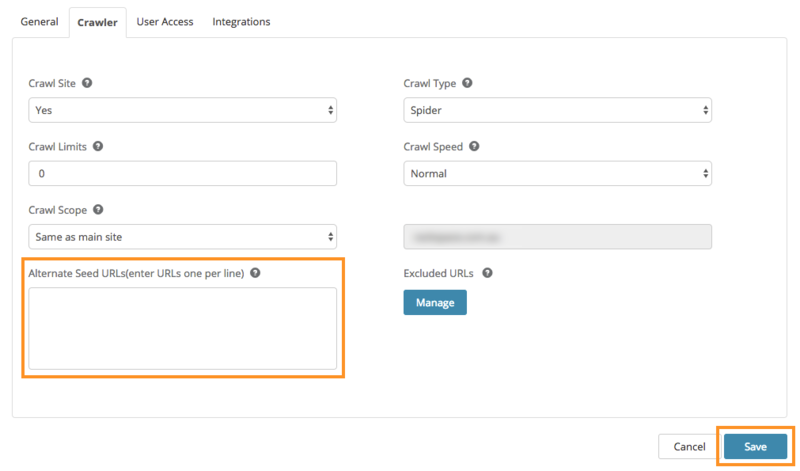 Scroll down in the Advanced setup menu and you will see the Alternate Seed URLs area, simply enter your alternate seed URLs there and proceed with the campaign creation.